I have done several issues on 80s commercials already including Nike "Revolution", Seagram Wine Coolers with Bruce Willis, Pepsi with Michael Jackson, Folgers Coffee at Christmas, Cadbury Creme Eggs at Easter, kids Cereal, Hershey Kisses and more. Interviews have sort of dominated my content lately and hopefully you have been enjoying those as much as I have. This year marks 30 years since McDonalds introduced one of its most popular menu items. 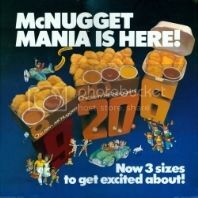 I wanted to revisit the launch of this item along with a couple other notable McDonalds introductions during the 80s. McDonalds had many memorable commercials during the 80s, but we will cover these new 80s debuts and the commercials that helped sell them. I know some are concerned about what the McNugget is made of, but I would rather not know and just continue to enjoy these tasty treats. Beginning in 2003, McNuggets are now made with only white meat. In 2011, four new dipping sauces were added to the lineup: Sweet Chili, Honey Mustard, Spicy Buffalo and Creamy Ranch (though my young daughter still prefers plain old ketchup). 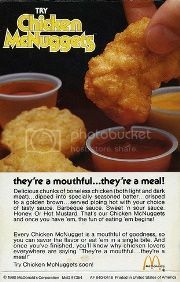 I am sure most children today can't imagine McDonalds without Chicken McNuggets, but before the 80s that was the case. In 1985, it was removed from the menu due to poor sales and rising pork costs. 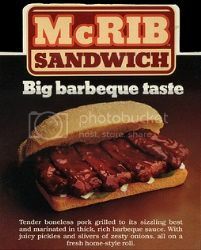 More recently the McRib has developed a cult following and is released annually in the U.S. as a limited time promotion. There is actually a McRib Locator website which can tell you which McDonalds locations are serving the McRib at any given point in time. You have to believe that the fascination is more to do with novelty than with taste. Either way, it is a piece of pop culture history from the 80s. Back in the day, many McDonalds sandwiches were made ahead of time and kept under a heat lamp until ordered. That process makes it difficult to include cool, crisp lettuce and tomatoes on a burger because they will wilt under the heat lamp. This also made it difficult for McDonalds to compete directly with Burger King's Whopper. So McDonalds came up with an idea to keep "the hot side hot and the cool side cool" with the McDLT. How awesome is that commercial? That special Styrofoam (polystyrene) container became the McDLT's undoing. As the country was becoming more environmentally and ecologically conscious in the late-80s, McDonalds felt pressure to discontinue the product. 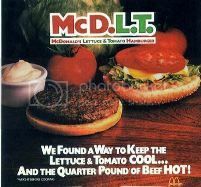 The container was a big part of the McDLT experience, so to appear more environmentally friendly, McDonalds ultimately discontinued the McDLT in late 1990. For some reason, this sandwich and advertising campaign made quite an impression on me, though I never remember really ordering or eating one myself. It's probably another one of those things that only us 80s kids remember well. Looking for more from OldSchool80s? @willalexmac What nickname was that??? 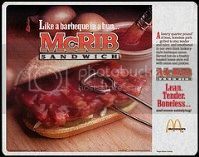 I had my first McRib in 1991 or 1992, and I never looked back. I'm a big rib-head. I started eating McNuggets in '92 also. I only started eating McNuggets because my local McDonald's started putting mustard in the burgers. YUCK! I HATE yellow mustard! I like McNuggets because they are the blandest of all the fast food chicken thingies I've tasted. I remember the Cheddar Melt, ProphetSword. That would've made a good addition to this article. As for a shake, this time of year it's appropriate to acknowledge the wonderful Shamrock Shake, too, vapor. My favorite McDonald's invention is the Egg Nog Shake. It's gotten the McCafe make over in recent years, but even prior to that, I considered it the official start of the Christmas season when I had my first Egg Nog Shake of the year. I remember the McDLT pretty well. I was a teenager working at McDonalds in that era, and I both made and ate them. They were awesome. One sandwich not mentioned here (that I really wish McDonalds would bring back) is the Cheddar Melt, which came out in 1988. I remember being the guy who was selected to teach everyone else about how to make them. This was an enjoyable look back at some 80's innovation on McDonald's part. And hey, two out of three survived the critical public masses, so that's not bad. I know I occasionally enjoy a McRib when they are being sold at my local McDonalds, but I am less of a McNugget fan than I used to be thanks to the media storm surrounding the "pink" stuff that is used. Yuck. Still, McDonalds is so ingrained within our culture that I don't see it ever going away. No amount of negative exposure can do it in. Thanks for this great read OldShcool80s!